The Wholesale Distribution business has had a challenging environment in the recent years and they decide the optimistic prospects in the near future. Most of the organizations expect their business to improve or atleast remain steady. As a strategy this business is focused on having a balance between the revenue growth and the cost savings. NetSuite is the best approach for this. It also helps in increasing the efficiency of the organization, streamline the processes and cut the IT and operational costs. It also helps in driving the inventory towards different channels. 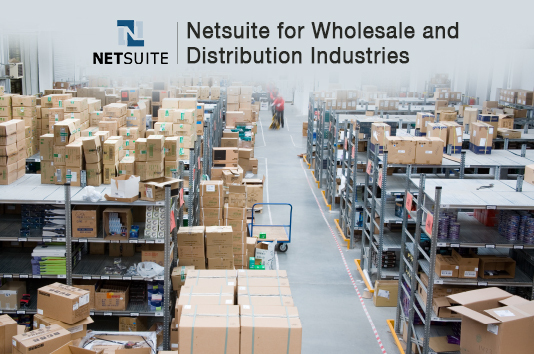 NetSuite used for the wholesale distribution industry combines with the customer facing sales force automation, marketing and service processes with the back office inventory management, fulfilling and an accounting system embedded all in one. Being a cloud-based application it helps in lowering the TCO by eliminating the on-premise server cost, license fees and site IT support and all this comes in with some rapid implementation and a quick ROI. With the NetSuite edition of Wholesale/Distribution, one can give the companies customer facing sales force automation. This would include various processes like quotes and orders-marketing and customer services that are linked seamlessly with the back-office inventory management. They are used for fulfilling the accounting activities all within a single and flexible business application. For implementing this NetSuite leveraged to almost over 800 distributor customers and complemented some of the best services. With this software of NetSuite one can grow its business and provide the new services with an increase in the customer service levels and cutting the costs. A survey conducted by NetSuite says that 81% of the wholesale distribution leaders identified a growth in their revenue. NetSuite helps in managing the end-to-end system all in one system. Right from marketing to the payment procedure all is done in this system. There is one single integrated system for all which is in real-time view of the customer across all departments and locations. It is an on demand model that provides an extended IT department while lowering the cost while providing access anytime and anywhere. It would be having the latest software, automation by which anything will work, your personal enhancements, configurations, eliminating a potential repeated expenditure. Doing it once is enough. Netsuite allows customers to configure the system to meet the company profile without the costly IT and developer overhead. If there are more needs or requirements they are easily modified via the Suiteflex. The trading partner processes extend their self service via the partner and the customer portals. The NetSuite “assistants” will make and manage the business environment and make it easier. The initial setup, data import, setting the web store and site, managing the ecommerce content and managing the matrix items, quote farms will be done by the assistants. 1. Growth, flexibility and an improvement in sales. One of the most consistent benefits that the wholesale industry has is the ability to sustain or grow the business due to the efficiency that one can gain from the process automation. It also helps the customers for developing some new sales channels or product lines. A new growth can be seen sometimes even in a triple digit. This industry tried searching a lot of options but the best fit is that of NetSuite. It is the most cost-effective and scalable solution. The other reason is that its implementation is quite fast, elimination of the need and backup and security, will reduce the internal IT and it will grow with your business. The customers who use this system have reported that the carrying cost of 15% to 30% is like the inventory replenishment, tracking the serial and lot number, bin management, demand some planning and some other capabilities. It is a real-time visibility in the stock which reduces the write-offs. It helps in increasing the visibility into pricing, availability and this demand allows the NetSuite customer to actively manage the margins, both in the purchase negotiations and sales. This business will truly know the COGS and it can quickly make the adjustments in price by the products or the class to be competitive. NetSuite helps in integrating the shipping and fulfilling the order in order to manage the multiple channels and the shipping requirements. Most of companies are able to provide some faster and accurate quotes on shipping and they can identify and even correct some of the shipping processes which are unprofitable. The customer service teams in the organizations mostly use the NetSuite for providing the customers with some up to date information on the availability, pricing and shipping of inventory. Most of the businesses can also give their customers a log in for their orders and tracking information, printing the statements, making payments and helps in doing many more things. The organizations that use NetSuite spend less time gathering in gathering and analyzing and also gain some greater visibility into the business with a centralized data store help in pre-building reports and dashboards. NetSuite also helps in the financial processes and will reduce the cost and time during the final audit. All the employees of the company get access to a dashboard where everything is seen and monitored easily. It’s like information at your fingertips. They are a tailorable period of comparisons and the out-of-tolerance notifications, it will give a real-time view and at a glance view of the company’s performance. There is a real time visibility in your business like quotations, orders/support issues that have time sensitivity. The saved searches will help in giving the users a rapid, repeatable adhoc reports on the dashboard itself. You can directly manage the transactions and drill it down greater from the dashboard itself. These calendars are used for individual and group scheduling. We can view the schedules and invite them for meetings, assign tasks and know the availability without exiting the program. One can see the news bulletins and can have a direct access to the content feeds on the dashboard from outside on the user’s choice. Why should you collaborate with Inspirria Cloudtech? Do you have a wholesale or distribution business and looking for a NetSuite Solution? We at Inspirria Cloudtech, are here to help you. You can take us as your secured cloud provider partner and NetSuite solutions with decade plus of experience working with 450+ Cloud projects. Push productivity to its optimum level with proven solutions, which is used by the best companies all over the world.